We will introduce Mr. Lewton-Brain's methods of working sheet metal by folding, deforming, and unfolding. 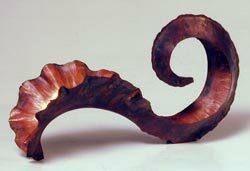 There will be demonstration and hands-on work, mostly in copper, which will provide a quick overview of the range of form-folding techniques. This class is a prerequisite to our Fold-Forming II class which is specifically for blacksmiths about fold-forming iron. There is Special Open Smithy time scheduled after the Fold-Forming II classes for those who wish to continue working out ideas and techniques while they're still fresh. If there is room, Fold-Forming I students will be welcome also. Gift Certificates for Fold-Forming I Introduction are available. If you're interested in taking Fold-Forming I Introduction and it's not on the calendar, please tell us using our Waiting-List Page.